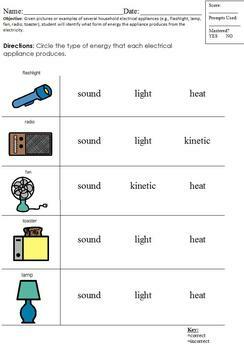 5.C.2.b Given pictures or examples of several household electrical appliances, student will identify what form of energy the appliance produces from the electricity. This is modified for students who are in an inclusive setting but cannot complete grade level requirements. It would also be helpful as a refresher for students or as homework. There are five words with picture clues. Students have to circle the type of energy the appliance produces. Boardmaker picture clues are helpful for students with autism. The Picture Communication Symbols ©1981–2010 by Mayer-Johnson LLC. All Rights Reserved Worldwide. Used with permission. Boardmaker™ is a trademark of Mayer-Johnson LLC.